While it is important to pursue water conservation and demand management efforts that will generate water savings in the near-term, DEP understands the value of planning for the future and for being prepared to respond to planned or unplanned water supply shortages. Over the past 75 years, New York City has experienced nine drought periods of record, the most severe of which occurred prior to the 1980s. As the city’s vast network of water supply infrastructure grew, drought periods became more manageable and shorter in duration. An important part of managing demand during drought periods was the response of the public to water conservation regulations. These “drought rules” served to curb water consumption through mandatory and voluntary water use restrictions on both indoor and outdoor water use. Historically, New Yorkers have had a strong track record in supporting citywide water conservation initiatives during drought. The city’s existing drought rules outline mandatory and voluntary water use restrictions that must be adhered to by private customers and city agencies alike. However, these drought rules only account for water shortages created by natural, hydrologic conditions measured by reservoir levels, and do not address water shortage conditions attributed to planned or unplanned outages of water supply infrastructure. In order to address this issue, the existing drought rules will be revised to account for water shortage conditions associated with water supply infrastructure. DEP will continue to demonstrate its commitment to water conservation and demand management by formalizing the responsibilities of city agencies during a water shortage condition in both the Water Supply Shortage Management Rules and Plan. 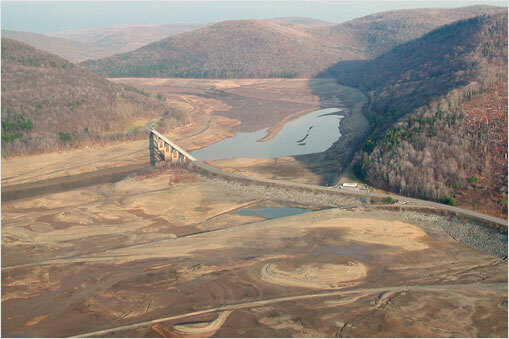 When a water supply shortage condition occurs, DEP will coordinate with the Office of Emergency Management to convene the Water Supply Shortage Condition Task Force made up of representatives from each city agency implement appropriate agency protocols. DEP also realizes the importance of public participation in achieving desired water consumption reductions during periods of water shortage. Therefore, DEP will develop a formal public outreach and communications program to educate and inform customers of water shortage conditions. Customer participation and compliance with mandatory water use restrictions during a water shortage condition are crucial to the city’s demand management strategy, not only during times of water shortage but also as part of long-term conservation efforts. Additionally, DEP will use the My DEP Account web portal to provide customers access to their current water use and information on targeted water use reduction goals based on the severity of the supply shortfall. By allowing customers to track their water use in near real-time and providing access to information on water supply shortfalls directly, they will be encouraged to monitor their consumption more closely. For more information, visit History of Drought and Water Consumption.